The Aquabats are known for their live show personas which are, if you’ll excuse the pun, pretty batshit. They pretend they’re a bunch of superheroes with crazy backstories, then stage a bunch of elaborate and choreagraphed fight scenes (*) against costumed foes while playing ska and surf music. They’ve been touring now for the better part of fourteen years, and their debut was the lone album they released under Horchata Labels — the band’s own label. Their debut is fun and polished from the outset, even if it’s relatively light on the theatrics and bombast that would highlight their later albums. In this early incarnation of the band (which would undergo rapid change before long), the music has a very raw, third-wave ska influence, not far removed from early Less Than Jake or Reel Big Fish. With a couple of exceptions, nothing on this album is as good as either of those bands. 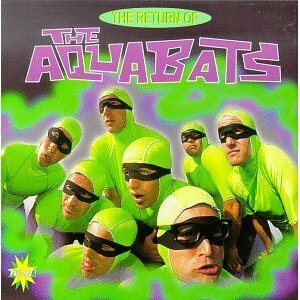 But the Aquabats’ trademark zaniness redeems the album enough for it to still be noteworthy. Return of the Aquabats includes two essential, mission statement-style tracks. The first is “Playdough,” the album’s opener. It’s gives the ‘why’ for the band’s alter egos: missing the innocence and imagination of youth. The song ends with a chant of “Take me back to my happy land,” which the band promptly does that, spending a large portion of the next nine tracks developing mythos and telling wacky faux-hero stories. The other mission statement track is “Aquabat March,” which introduces The Aquabats as fun-loving superhero personas. The track is not only essential for the characters, but one of the stronger songs musically. It blends the ska from the rest of the album with sing-along march/chamber hall that gives some indication of genre blending that the band would make a trademark later in their career. In all, Return of the Aquabats feels a little bit like a rough draft of the madcap brilliance this band was destined to become, especially since a few of these tracks were again on the far-superior The Fury of the Aquabats that came out the next year. The tone here is a little bit off at times (particularly “Idiot Box,” an anti-TV anthem that contradicts the pop culture pastiches of the rest of the album) and the jokes miss more than hit. Still, the cheeseball silliness of songs like “CD Repo Man” and “Aquabat March” make this a worthwhile listen for the right type of fan.